CLARINS Liquid Bronze Self Tanning Refreshes, Softens For face and décolleté 125ml offers a gorgeous, honey-golden tan come rain or shine. The pioneering blend of DHA and Erythrulose promotes a more natural, even, stable and long-lasting colour. A radiant glow isn't hard to achieve with this face and décolleté self tanner: easy to apply and quick to dry, skin is left soft, supple, moisturised and protected against free radicals. Pour some of the product onto a cotton wool pad or the hands, and lightly sweep over the face, neck and décolleté in swift motions. The quick drying formulation means that moisturiser, make-up and sun protection can be applied immediately. To intensify colour, apply as often as you like. Colour will develop in just a couple of hours. Avoid brows and hairline and always wash hands and nails after use. Optimise results by exfoliating the skin first. 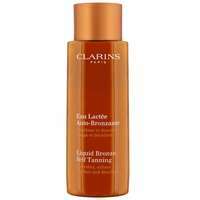 Active Ingredients: DHA (Docosahexaenoic Acid), Erythrulose, Aloe Vera, Vitamin E.
CLARINS Liquid Bronze Self Tanning Refreshes, Softens For face and décolleté 125ml was found on 4 websites and was price compared using EAN: 3380811420103. The cheapest CLARINS Liquid Bronze Self Tanning Refreshes, Softens For face and décolleté 125ml is shown as the main item, prices range from £18.45 to £21.00, excluding delivery. Price comparison based on price and delivery charges, with any valid discount codes being applied, is shown in the table above. Prices and information correct at the time of publication.